Pretty much regarded as the authority on all cultural, social, political and historical aspects of the South American continent, the Sounds And Colours web site is a source of useful informative insights. Following the successful crowd-funded Colombia edition in 2012, the latest venture in print maps out the creative terrain of the ‘BRIC’ giant, Brazil, in film, music, art and literature. An all-encompassing purview, with occasional focus on fringe activities, burgeoning scenes and the progenitors of Brazilian culture, this bit-size guidebook plots a loose course back and forth across the country’s vast and varied terrain. Sticking in the main to a concatenate series of creative and historically rich city-states, the pool of over 40 contributors also extoll the virtues of their own passions and interests; often in remote or off the beaten-track locations. Flying down to ‘Rio’, where this journey begins, we hear of the fiesta capital’s lesser known leftfield rap scene and brass band resurgence; stepping off to visit the city’s lively music hub, the Plano B record store and to talk with one of the featured, accompanying CD acts, the Chinese Cookie Poets. Rio’s closest rival and eating away steadily at its allure, São Paulo is on the rise. With a GDP equal to that of Israel, Portugal or Irelands, Paulo has considerable weight as a center of finance. But it is the music that we are drawn towards, as it competes to become Brazil’s number one hotspot. Once again the Hip Hop scene takes the lead; kicked off in Brazil by the fabled folklore, images and excitement of Wildstyle and Beat Street. Even though Wild Style wouldn’t receive an official release until 2004, the echoes and permeation’s from pirated copies were enough to kickstart a street culture revolution. Integrated with the unique polygenesis mix of South America, Brazil has since exported rap music back to its American progenitors – lifted, sampled and hooked by Madlib, Jay Z and Common, to name just a few. The travelogue winds its way through Salvador, visiting the ‘de facto’ capitol of the ‘black Atlantic’, Bahia (a city that is said to have more in common with new Orleans than Brasilia), home to Bossa Nova and ‘bass’, and delves into the independent film region of Recife. Revelatory throughout, dips into the Amazon shine a light on the bustling thoroughfare of Belém, honing in on the regions cheesy synth phenomenon, technobrega. Self-mocking, aware of its own cheapened sound, ‘brega’ means tacky. This hasn’t stopped the likes of The Strokes, Pet Shop Boys and serial culture gannet, Madonna, from lapping it up. For those still needing a gentle push in the right direction or unfamiliar with the multitude of musical delights that Brazil has to offer, there is also a handy ‘twenty influential’ albums section and complimentary CD to peruse: choice picks include the Ghanaian Latin disco of Bixiga 70, aggressive favela rap style of B Negão & Os Seletores de Frequência, and, surprisingly delightful, art school post punk of Ex-Exus. As with the Columbia almanac, there are also features and essays on film (Walter Salles and esteemed Cinema Novo auteur, Glauber Rocha), art (from the tagging ambassador Anarkia Boladona, to the toiling social realism of Candido Portinari) and literature (the burgeoning literary festivals and resurgence of Brazil’s, indigenously celebrated but mostly unheard of outside their own native land, authors). Though the country has blossomed of late (hosting the World Cup this summer and Olympics in 2016), the disparity between the dirt poor and uber elite still leaves a sour taste in the mouth. And even with a renaissance of sorts in the arts, Brazil’s illiteracy rate stands at close to 9% (14.1 million people over the age of 15). 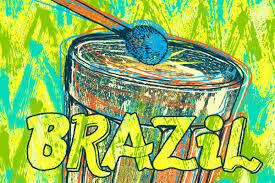 Warts and all, this book will set right certain prejudices and highlight lesser known aspects of the South American giant’s history, whilst offering a easy to navigate oeuvre of Brazil’s charismatic, rambunctious, culture.